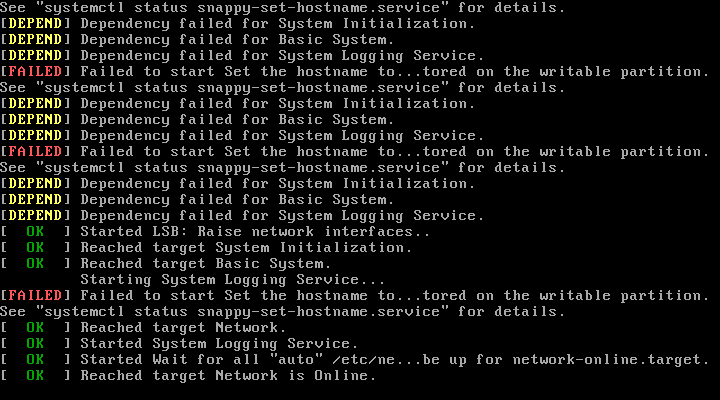 I set the hostname via snappy config to 'snappy-1504_edge-amd64' then rebooted. On reboot I see the errors in the attached screenshot. I'm guessing the problematic character is '_' even though http://www.freedesktop.org/software/systemd/man/hostname.html states that it should be allowed. Note, I at first changed it to snappy-15.04.edge-amd64, verified /etc/hostname was set, rebooted, and that went fine. I then changed it from snappy-15.04.edge-amd64 to snappy-1504_edge-amd64, verified /etc/hostname was set, rebooted and it failed to boot. The `snap config` command is not yet available but once it will become available again we will need to sanitize this input.